Hawaii Island (also known as the Big Island) is a spectacle of nature. From the molten lava flowing from Hawaii Volcanoes National Park to the snow-capped summit of Mauna Kea, Hawaii Island is full of extremes: desolate and dry in one place, lush and green in another. More than twice as big as all the other islands combined, you’ll find all but two of the world’s climatic zones on Hawaii Island. The youngest island in the archipelago, Hawaii Island was believed to be the first island Polynesian voyagers from the Marquesas Islands set foot on 1,500 years ago at Ka Lae (South Point). During this time of discovery, Hawaii Island was divided into separate chiefdoms and war between factions was common. The Kohala-born Kamehameha conquered Hawaii Island and went on to unify the Hawaiian Kingdom. Akaka Falls State Park: At Akaka Falls State Park, located along the northeastern HamakuaCoast, you can see two gorgeous waterfalls on one short hike. The pleasant 0.4-mile uphill hike will take you through a lush rainforest filled with wild orchids, bamboo groves and draping ferns.As you follow the paved footpath, you’ll first see 100-foot Kahuna Falls. Continue to follow the loop around the bend, and you’ll discover towering Akaka Falls which plummets 442-feet into a stream-eroded gorge. Beautiful Akaka Falls is perhaps Hawaii Island’s most famous waterfall. Easily accessible, this hike takes less than an hour. Coffee Plantations on Hawaii Island: 100% pure Kona coffee is a rare commodity exclusively grown in north and south Kona. The high elevation, constant cloud coverage and rich volcanic soil from Hualalai Volcano in the upland slopes of Kona create an ideal environment for harvesting this unique Hawaiian coffee bean. There are hundreds of coffee farms in Kona, from the small art town of Holoalua to Kealakekua, and many offer tours to the public. Visit thriving coffee orchards and learn about the meticulous harvesting process. Then explore the coffee mills and see how the beans are processed. Some of these farms with available tours include the Kona Coffee Living History Farm, Mountasin Thunder Coffee Plantation, Greenwell Farms, Hilo Coffee Mill (on the Hilo side) and many more. The Kona Coffee Cultural Festival, held during November in Historic Kailua Village (Kailua-Kona) is a must-see event for coffee lovers. Downtown Hilo (Hawaii Island): Start your visit with a stroll down Kamehameha Avenue facing beautiful Hilo Bay and discover a variety of local shops, restaurants and attractions including the modern aloha wear at Sig Zane Designs, the neo-classical Palace Theatre built in 1925, and the bustling Hilo Farmers Market. Visit the East Hawaii Cultural Center, the central hub of the Hilo art scene, dedicated to preserving and sharing cultural, creative and traditional arts on the island. The Pacific Tsunami Museum chronicles the cataclysmic natural disasters of 1946 and 1960 forcing Hilo to rebuild further inland using parkland as a buffer. The Lyman Mission House and Museum features a historic house built in 1839 by American Christian missionaries. The Mokupapapa Discovery Center brings to life the culture, history, natural science and virtually untouched environment of the Northwest Hawaiian Islands. Hamakua Heritage Corridor: Take a memorable day trip along the Hamakua Coast and drive along sea cliffs, through lush valleys and tropical rainforests. The beautiful Hamakua Heritage Corridor drive begins in Hilo and ends at the Waipio Valley Lookout. Along the way, you’ll explore old plantation towns, see amazing waterfalls and discover scenic detours along the way. Hawaii Volcanoes National Park: Watch the landscape change before your very eyes at Hawaii Volcanoes National Park. Located 30 miles southwest of Hilo, this is the home of Kilauea volcano, one of the most active volcanoes on earth. The chance to witness the primal process of creation and destruction make this park one of the most popular visitor attraction in Hawaii and a sacred place for Native Hawaiians. The park encompasses 333,000 acres from the summit of Maunaloa to the sea. Here you’ll find 150 miles of hikingtrails through volcanic craters, scalded deserts and rainforests as well as a museum, petroglyphs, a walk-in lava tube and two active volcanoes: Maunaloa, which last erupted in 1984 and Kilauea which has been erupting since January 3rd, 1983. The extraordinary natural diversity of the park was recognized in 1980 when it was named a World Biosphere site by UNESCO and in 1987 when the park was again honored as a World Heritage site. Many visitors have the opportunity to watch the Earth form during volcanic eruptions. Historic Kailua Village (Kailua-Kona): Located just 15 minutes south of Kona International Airport, Historic Kailua Village (Kailua-Kona) is a lively seaside town in the heart of the sunny Kona Coast. Once a sleepy fishing village and a retreat for Hawaiian royalty, Kailua Village is now a destination for affordable accommodations, great shopping, dining, and learning about Hawaii’s rich culture. Stroll down the main road of Alii Drive and you’ll find a variety of shops and restaurants. But look closer and you’ll also discover some very important Hawaii Island historic spots. Hulihee Palace and the Mokuaikaua Church are both located right on Alii Drive. King Kamehameha I spent his later years living near the current site of King Kamehameha’s Kona Beach Resort until his passing in 1819. The Ahuena Heiau, located on the grounds of the hotel, is a reconstructed temple rebuilt by Kamehameha himself and is on the register of National Historic Landmarks. Kailua Pier is a great place to watch the sunset and is also the starting and finishing point of the Ironman World Championship (October). Keauhou: A short drive south of Historic Kailua Village, the Keauhou Resort area has emerged as one of Hawaii Island’s great cultural destinations. The area is bordered on the north coast by beautiful Kahaluu Bay with the famous Kona Coffee country of Holualoa just up the slopes of Mount Hualalai. Featuring the Sheraton Kona Resort and Spa at Keauhou Bay and the Outrigger Kanaloa at Kona, the Keauhou Resort is an area blessed with sunny weather and perfect waters for snorkeling, scuba diving and kayaking. At night, the Keauhou area attracts manta rays that feed on microscopic plankton near the shore. You can also sometimes see honu (Hawaiian green sea turtles) in the shallow tide pools. Pololu Valley Lookout: As you drive north on Highway 270 where the black lava landscapes of the Kohala Coast give way to the flourishing, green pastures of North Kohala, you’ll be rewarded at the end of your journey with an unforgettable view from the Pololu Valley Overlook. Park your car in the small parking lot that is literally at the end of the road and treat yourself to an inspiring view of the verdant cliffs of Pololu Valley and the dramatic northeastern coastline. You can take a steep hike down to the valley floor and the black sand beach, although swimming is discouraged because of strong currents. Along with the Waipio Valley Overlook, which also offers a view of Hawaii Island’s northeastern tip but from the south side, this is one of the most spectacular panoramic views on Hawaii Island. Puuhonua o Honaunau National Historic Park: Located on the coast of Honaunau Bay in south Kona, Puuhonua o Honaunau immerses you in Hawaiian culture. This 180-acre national historic park was once the home of royal grounds and a place of refuge for ancient Hawaiian lawbreakers. Kapu, or sacred laws, were of utmost importance to Hawaiian culture and the breaking of kapu could mean death. A kapu-breaker’s only chance for survival was to evade his pursuers and make it to a puuhonua, or a sacred place of refuge. Once there, a ceremony of absolution would take place and the law-breaker would be able to return to society. Puukohola Heiau National Historic Site: The majestic, stone Puukohola Heiau can be seen off the road, just north of the resorts of the Kohala Coast. This National Historic Site is home to one of the largest restored heiau (temple) in Hawaii and is part of the National Park System. Heiau were sacred places of worship for Native Hawaiians, and Puukohola Heiau was a site built to fulfill a historic prophecy. North Kohala born Kamehameha the Great was advised by his kahuna (priest) to build and dedicate Puukohola Heiau to the war god Kukailimoku to help in his efforts to unite the Hawaiian Islands. The fortress-like heiau was constructed overlooking the Kohala coast between 1790 and 1791. King Kamehameha ultimately fulfilled the kahuna’s prophecy when he united the Hawaiian Islands in 1810. 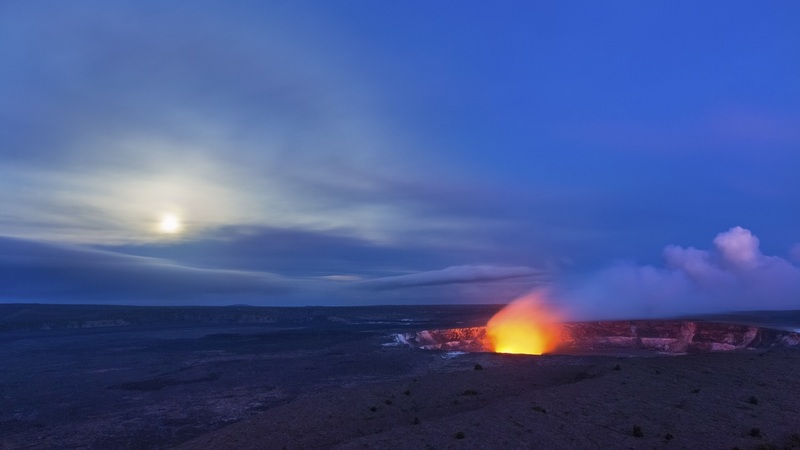 Volcanic Eruption Viewing: The exciting volcanic activity continues to evolve on Kilauea Volcano in Hawaii Volcanoes National Park. Excellent viewing is still possible most days from the Thomas A. Jaggar Museum overlook. The small museum has informative volcanology exhibits and an excellent bookstore with DVDs, posters, maps, t-shirts and more—all of it contributing to our understanding of volcanoes in this extraordinary national park. The excellent overlook at the Jaggar Museum is open, and will remain so as long as conditions permit, although the downwind stretch of Crater Rim Drive is closed off for now. Visitors can also still get stunning views of the heavy plume of steam and gas from the Volcano House hotel and along the adjacent trail. Meanwhile, 25 miles down to the coast at the end of Chain of Craters Road you can hike to an area where lava from Kilauea Volcano was at one time flowing into the sea. In July 2008, there were especially dramatic explosions as fiery lava burst into the sea, and from spectacular outbreaks of molten lava in remote upslope locations. The show is currently northeast of the park on the coast at Kalapana, located at the end of Highway 130 in the PunaDistrict. Thousands of visitors every week hike to this site to watch lava ooze across the coastal plain, then roll into the sea leaving huge clouds of steam and sprays of molten rock in its wake. The viewing area is open daily from 5 p.m. to 10 p.m., with the last car permitted into the parking area at 8 p.m.
Waimea: Travel east, inland from the volcanic Kohala Coast to discover Waimea (also called Kamuela), which is unlike any other place on Hawaii Island. Known as paniolo (Hawaiian cowboy) country this historic area full of rolling, green pastures is still home to cattle, cowboys and ranches. Waimea is a place where stop signs read “Whoa,” instead of “Stop.” This is the home of Kahua Ranch, a working sheep and cattle ranch that allows you to learn about the paniolo lifestyle. Here you can explore the scenic landscapes of Waimea by horseback or ATV. Then visit An Evening at Kahua Ranch to fully experience the best of Waimea’s cowboy country. Kolekole Beach Park: Twelve miles north of Hilo on the Hamakua Coast, you’ll find this jungle garden by the ocean, with a nearby stream lined with smooth lava rocks and a waterfall. A banyan tree leans over the river with a rope swing. Onekahakaha Beach Park: A favorite with locals, this small, shallow sand-bottomed ocean pool just east of the Hilo Airport is one the safest swimming areas along the Hilo coast, with tide pools and inlets. Perfect for family snorkeling, it also offers lovely views of Hilo Bay. Richardson Ocean Center/Lelewi Beach Park: The shallow bay fronting Richardson Ocean Center is the most popular snorkeling site on the east side of the island. The center, which is two miles south down Kalanianaole Avenue from Onekahakaha Beach, has picnic pavilions, restrooms, parking and showers. Punaluu Black Sand Beach: 30 miles south of Hawaii Volcanoes National Park is Hawaii Island’s famous black sand beach and a great place to see honu (Hawaiian green sea turtles) basking on the shore. An adjacent campground is popular with local families and fisherman. Anaehoomalu Beach: This stretch of beach next to the Waikoloa Beach Marriott is a place to rent kayaks, hydro bikes and body boards or to snorkel, scuba dive or sunbathe. Hapuna Beach: The largest white sand beach on Hawaii Island, this world-renowned beach is located adjacent to the Hapuna Beach Prince Hotel. Holoholokai Beach: Near the Fairmont Orchid Hawaii, Holoholokai Beach isn’t a sandy beach, but it’s a beautiful place to explore tide pools and snorkel. It’s a short walk from the Puako Petroglyph Archaeological Preserve, where you’ll find hundreds of ancient carvings in the lava rock. Kaunaoa Beach: Adjacent to the Mauna Kea Beach Hotel, parking spaces are limited, so it’s good to arrive early. 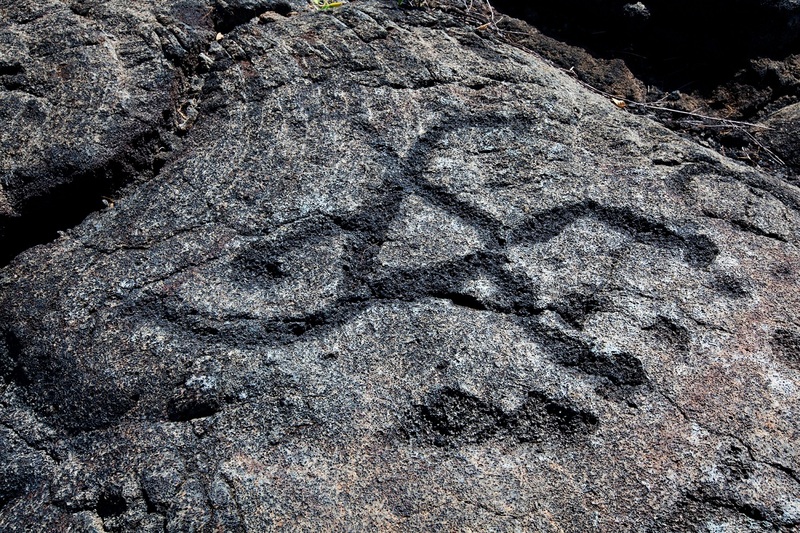 Hawaii Island is home to several sites which feature petroglyphs like this one. Kahaluu Beach: Located just south of Historic Kailua Village (Kailua-Kona), in the Keauhou area, Kahaluu Beach is known for honu (Hawaiian green sea turtles) that frequent its shores. Laalao Beach: Also known as Disappearing Sands and Magic Sands, this white sand Kona beach is located on Alii Drive just south of Historic Kailua Village.This popular pocket of sand is great for splashing in the surf, body-surfing and body-boarding. There are restrooms, showers and a lifeguard, but limited parking. This small beach may disappear overnight due to tidal shifts or strong surf, but always returns. Samuel Spencer Beach Park: Located a half-hour north of Historic Kailua Village (Kailua-Kona), Samuel Spencer Beach Park is well protected by an outside reef, which allows for calm swimming and snorkeling waters on most days. The beach park has picnic pavilions, tables and barbeque grills and is within walking distance of Puukohola Heiau National Historic Site. A visitor to Hawaii Island has the opportunity to experience nature in its most primal environment, but also enjoy all the comforts of modern luxury. So, if you have an appetite for adventure, but want to rejuvinate in your down-time, Hawaii Island may ideal for you.